In 2019, the Brockville Rowing Club (BRC) celebrates 125 years. As the late Don Swayne, author and BRC board member, wrote in The Brockville Rowing Club: 100 Years of History, the story of the club is not just about its longevity, but about the people and the community that supports it. The BRC as it’s affectionately called, is an institution in the community of Brockville, Ontario, Canada—and a legend in the sport of rowing. For a small-town club, the BRC is known for punching above its weight, with success at home, across the province, the country and around the world. We are indebted to the work of Mr. Swayne, and countless BRC members and volunteers for the following history. One of Ontario’s oldest communities, Brockville sits on the shores of the mighty St. Lawrence River. The river was the city’s centre of commerce and, later, recreation. 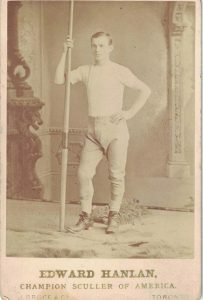 Among Brockville’s young men, rowing was a favoured pastime with news reports of regular races dating back to the 1840s. 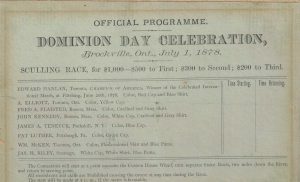 In 1860, Brockville made a name for itself in the rowing community when a local crew consisting of George A. Dana, Robert Bowie, George Reid, stroke Elias Gay, and coxswain Henry Beach competed in Montréal, Québec. 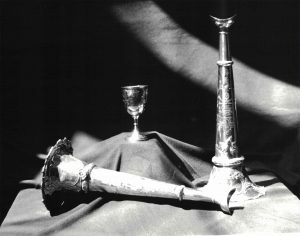 Against crews from communities in Canada and the United States of America, Brockville was triumphant, earning the Tiffin Goblet as a trophy, one still in use today for boat christenings. That success spurred rowing competition in the city. By the 1870s, Brockville’s waterfront was the scene of “fortnightly single scull races.” The community’s passion for rowing attracted the 1878 Dominion Day regatta, featuring the great Edward “Ned” Hanlan and many of the finest scullers in North America. 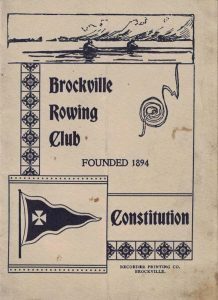 Despite rowing’s growing popularity, it wasn’t until 1894 that the Brockville Rowing Club was formed with the drafting of the club constitution. A clubhouse dedicated to aquatic sports was completed in July of 1895, thanks to funds raised by the Brockville Amateur Athletic Association (BAAA). Located at the foot of Ferry Street, the clubhouse was home to both rowing and canoeing enthusiasts. The first official meeting of the Brockville Rowing Club took place that September. At the meeting, the constitution was ratified, and the inaugural executive was elected. 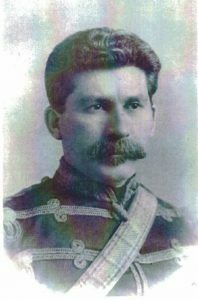 The renowned Major James Morrow Walsh of the North-West Mounted Police was named club president. Other executives included vice-president V.H. Moore M.D. ; second vice-president William S. Buell; secretary-treasurer, A.C. Loosemore; executive committee, William A. Gilmour, Freemont B. Cossitt, William J. Curle, W.J. Gilmour, and Robert A. Bowie M.D. ; rowing committee, George E. McGlade, Charles A. McNaughton, Alison G. Bowie, Frank I. Ritchie, and the captain; the house committee, Cossitt, W.J Gilmore and the secretary. Purchased its first new four-oared shell from Clasper, a noted racing shell builder in London, England in 1897. 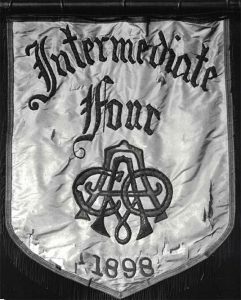 Hosted the Canadian Association of Amateur Oarsmen (CAAO) championships in 1896, 1897 and 1899. 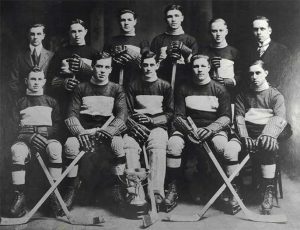 1889 the BRC hired its first professional coach, Jimmy Rice of Toronto. With the dawning of the new century, the BRC continued its steady growth. 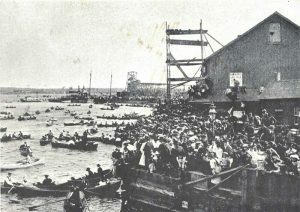 Its reputation was bolstered by hosting the 1902 CAAO championship regatta, the last before it moved permanently to St. Catharines, Ontario. Locally, the BRC’s own regattas provided excellent competition with 15 crews competing in the 1913 spring regatta. The club also continued its tradition of providing members with other forms of recreation such as lawn bowling, football and hockey. The outbreak of the First World War saw BRC members answering the call for King and country. By the end of 1914, 14 members were overseas. By the war’s end, 80 BRC members had served, with 13 giving their lives in freedom’s cause. In 1920, the BRC joined with the Ottawa and Lachine clubs to form the Eastern Rowing Association (ERA). 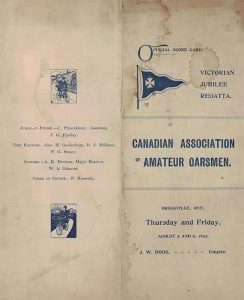 While the first ERA regatta was in Ottawa, Brockville played host in 1922. Proceeds from the regatta funded the purchase of a new four-oared racing shell from the Sims Works in Putney, England. In 1903 two gigs (a four-oared working boat that carried a coxswain) were purchased from Brockville boat builder George Hutton. The club bought an additional two gigs and a single shell in 1904. William H. Harrison presented the club with a new single racing shell in 1908. In 1914, four new boats were acquired from the Arkroyd Brothers of Toronto—two fours and two singles. The Great Depression reached Canada and had a profound effect on society—and the BRC. With declining membership, the club faced foreclosure. Through the generosity of four club supporters, James R. Maclaren, Donald E. Lewis, William H. Comstock, and George T. Fulford II, the mortgage was paid off, and the property purchased. While the club was saved, membership continued to drop as people struggled to pay the annual fee. The BRC executive banded together to put the club on more secure financial footings. On the rowing side, they hired Abbie Buett as head coach. Under his tutelage, crews distinguished themselves at events, taking its first eight at the 1933 Royal Canadian Henley and setting a record in the junior 145-pound class. It wasn’t all easy-going, however. The club’s coaching staff wasn’t stable, with Jimmy Rice, Buett’s successor replaced by “Peeny” Grant, a former BRC coxswain, in 1936. Then, in December of 1937, the clubhouse was the target of an arsonist. The fire caused significant damage to the north part of the building, resulting in increased operating costs. But it was the outbreak of the Second World War, that saw the BRC struggle as membership numbers again plummeted. 80 BRC members had joined the armed forces by 1942. At the close of the war, the BRC honoured its 150 serving members including 13 lost. A scroll illustrated by A.J. Casson, a member of the Group of Seven, still hangs in the BRC as a tribute to these members. Post-war, the BRC enjoyed continued success on the water. Cedric Liddell, a two-time Olympian, was hired to coach BRC crews destined for the 1947 Royal Canadian Henley. The move paid off as Brockville was the only Canadian club to win two Henley events. Brockville again showed itself to be a gracious host, holding the 1948 ERA championships which were heralded by many veteran oarsmen as the most spectacular ever. In 1953, fundraising efforts and the work of many volunteers enabled the construction of a new shell house. At the same time, significant repairs to the clubhouse began, with work being completed in 1955. In 1954 Ralph Gifford was appointed as the new head coach. He brought stability to the coaching situation and introduced new training methods. In 1955, the BRC achieved five championships at the Royal Canadian Henley and followed up with three the next year. That year, the BRC had an eight that was virtually unbeatable. The executive committed to sending them to England to compete in the Royal Henley. While the crew didn’t return victorious, their exploits earned them a hero’s welcome—and helped further stoke the city’s passion for rowing. BRC acquired its first eight in 1930 thanks to club benefactor George T. Fulford II. The club hosted the ERA championships in 1948. In 1948 the BRC purchased two sets of sculls from Ayling of England and four rowing machines to allow athletes to train year-round. In 1950, the club ordered a four-oared, two-piece sectional boat from Jen-Craft of Kelowna, British Columbia and christened “Russell R. Shorey”—another eight, christened “The St. Lawrence” was delivered in 1953. Throughout the 1960s, the BRC focused on rejuvenating the club’s equipment. Through the generosity of the club’s many friends and supporters, funding through the Ontario government, and some good old-fashioned fundraising, new boats and new oars were purchased. The club also formalized its incorporation. Over the years, the original charter and incorporation papers were misplaced. The executives’ care in these matters would prove a great asset to the club in later years. The BRC continued to invest in its highly successful high school program. In 1960, the Royal Canadian Henley cut all high school events. The Canadian Secondary School Rowing Association (Schoolboy) Championships regatta expanded as a result. Brockville Collegiate Institute and Vocational School (BCI) had its first goal medal in 1960 when the crew of Doug Jodoin, Dries Arkeveld, Bob Ellacott, and Mike Cody won the 145-pound four. At Henley two months later, Lynn Tousaw, Dries and George Arkeveld, and Cody won the same event. In 1963, the BRC named Douglas Marshall head coach. Under his guidance, BRC oarsmen racked up a fantastic record of successes on the national and international stage. The year 1969 also saw the BRC celebrate its 75th anniversary. As part of the celebrations, the club reached out to former oarsman, encouraging them to renew their memberships. That summer, the BRC also hosted an Old Boys regatta to an enthusiastic response. Oarsmen from several eras attended, some to race and others to watch and reminisce. Russell R. Shorey and James R. Maclaren were honoured with the BRC’s first Award of Merit in 1962 and the club christened three new boats—a four from Seattle, Washington-based Pocock, and eights. The BRC Old Boys Association donated a new coach boat and motor in 1964. In 1966 the club was gifted two racing shells, an eight from the Rotary Club and a single from Donald E. Lewis and John Howison in memory of Thomas “Monk” Major. Head coach Douglas Marshall was named Brockville Sportsman of the Year in 1968. The late Ralph B. Gifford was honoured with the club’s Award of Merit in 1969, and a new racing shell christened in his name. Mrs. Wilhelmina Brownfield presented the club with a new cox four in memory of her husband, the late Major-General H.O.N. Brownfield. In 1970 the BRC honoured a long-time benefactor, George T. Fulford with the christening of the “George T. Fulford” Pocock eight. While never a president of the club like his father, Fulford was a steadfast supporter, generous to the club in times of need. He helped the BRC purchase much-needed equipment and gave freely of his time and advice—a true lover of the sport and a steadfast friend to the BRC. The 1970s saw the BRC host the 1972 Ontario championships, the first held outside of St. Catharines. It was a significant undertaking for such a small club, given the one-day program featured 22 races with 79 entries from nine Ontario clubs. More than 3,000 spectators watched the action from Brockville’s shoreline. The club also hosted the 1974 Ontario championships. This time, the event was a three-day affair including trials designed to select the Ontario team that would compete nationally. In all, the race program featured 34 events, with 220 crews. Brockville crews would take six provincial titles. Building on the interest from that performance, in 1975 the BRC started a summer rowing program for youth designed to acquaint prospective athletes with the sport. That same year a BRC lightweight four participated at the World Championships in Nottingham, England. While they weren’t victorious, the community rallied behind the crew of Jim Earle, Bill Cody, Bill Earle, and John Armitage. In the summer of 1979, a composite crew including the Earle’s and Jim Smith and Dan Charlton of Ottawa won the lightweight trials qualifying for the world championships in Bled, Yugoslavia. 1976 brought the Olympics to Montréal, Québec. Among the Canadian contingent were three BRC athletes, Betty Craig, Dolores Young, and Jane Pal. Their selection to the national team highlighted the success of BRC’s oarswomen, as women’s rowing become an official event at that Olympic Games. The BRC’s own women’s program was growing in popularity, and it was during this decade that Alma Rowan became the first woman president of the BRC. A focus on lightweight events and new training regimens helped the BRC’s 135-pound weight class win no fewer than nine major championships in 1979. The string of victories started at the Canadian Secondary School Championships and continued through the Canadian Royal Henley. During this period, it became apparent the old clubhouse was unsafe, requiring major renovations to stabilize its underpinning. Unfortunately, the cost to repair the 81-year old building was prohibitive, making a building on land more feasible for the club. Demolition of the old clubhouse took place in 1978 to make way for the new building. Funding for the new facility, designed by Westport architect Horace Roberts, came through a Wintario grant. Through the generosity of four notable Brockville families—Fulford, Comstock, Maclaren and Lewis, who donated the club land and buildings previously held by St. Lawrence Aquatics Limited. The remaining funding, about $135,000, was raised in the community and enabled the new facility to open in December of 1978 with a ribbon-cutting ceremony. While these changes were happening, the BRC also hosted a training camp for 70 athletes hoping to find a spot on the Canadian rowing team. It was a highly successful camp, with Craig, Young and Pal returning to the national boat, coxswains Chris Marshall and Thea Beckering and Coach Doug Marshall selected to participate in the world championships in New Zealand. In 1979, the BRC was champion of the Royal Canadian Henley under a new points system. Based on overall performance, The Royal Canadian Henley Efficiency Award required a club to have at least 14 competitors and entered in at least one sweep oar event. An Italian eight was purchased from Donoratico and christened the “Harry R. Phillips Sr.” in 1972. In spring 1977, three racing shells were christened: “The City of Brockville” coxed four, the “Doug Marshall” straight four, and the “Helen Maclaren” eight. A new four was christened after former president and coach, Fred Steele. The 1980s saw the BRC continue to host important regattas including the 1980 ERA championships. Adding to the event’s prestige was the new Gifford Trophy for 135-pound fours. The BRC continued to be recognized at the highest levels of the sport. Head coach Doug Marshall was named manager of Canada’s junior rowing team heading into the 1981 world championships. Oarswomen Betty Craig and Delores Young again represented Canada at the 1984 Olympics, along with Brian McRobie and Ben TeKamp. Brockville’s outstanding performance at the 1981 Royal Canadian Henley saw the club take its second efficiency award, beating out the University of Victory. Overall, Brockville reached the finals in six events, winning four as well as achieving a second and third place finish. In 1985, the BRC had its biggest medal haul ever at the Ontario championships, winning eight titles. They followed that up with two Canadian titles. During this decade, the women’s program continued to grow. In 1982, Brockville Collegiate Institute grabbed three of the six national high school titles claimed by Brockville. In 1988, Doug Marshall’s lightweight women’s crew made a clean sweep to win their Schoolboy, Ontario, Canadian and Henley events. Their success earned him CARA’s award for coach of the year. His son Chris won the same award in 1989 when his lightweight women’s crew won the Ontario and Henley championships. In 1981, the club constitution was changed to extend executive terms of office to two years, with half the executive up for election each year. With more stability in the executive, members focused on ensuring its financial standing, by starting proceedings to have the BRC declared tax-exempt. Leeds MPP Robert Runciman introduced a Private Members Bill in the Ontario Legislature exempting the BRC from property taxes. It received Royal Assent on June 29th, 1988. Mrs. Helen Maclaren donated a new shell in honour of her father-in-law John Maclaren. The BRC launched a recreational rowing program led by former president Richard Babcock. Dr. Jack McDougall received the Award of Merit. In the 1980s, more local high schools sent athletes to the club with South Grenville District High School and St. Mary’s Catholic School joining Brockville Collegiate Institute and Thousand Islands Secondary School. The Jessie Lata Foundation funded the purchase of a new shell and hatchet oars. The 1990s were a milestone decade for the BRC, which celebrated its 100th anniversary in 1994. Planning began early in 1993, with Ben TeKamp, a long-time supporter, leading the special committee. The Brockville Museum honoured the milestone with a special display including the club. At the annual spring regatta, participants received special centennial medals. The club also welcomed a new, high-tech fibre four by Kaschper, christened “Century One 1894-1994” by donors Marion and Helen Howison. Over 100 years the BRC established a tradition of winning, earning 71 Royal Canadian Henley championships, 77 Ontario crowns, 38 national titles, and 35 Schoolboys. Brockville athletes also competed at international levels, including at the Olympics, the Pan American Games, and the World Rowing Championships. The high school program also enjoyed expanded success, as Thousand Islands Secondary School won its first national high school rowing championship in 1993, and St. Mary Catholic High School its first in 1994. A major trophy named for Ralph Gifford was purchased through a fund-raising drive. The trophy was given to the Royal Canadian Henley in 1992. Doug Marshall, club member since 1954 and head coach, was honoured with the Award of Merit for his service. The first Ontario Ergometer championship was held in 1993 at Ridley College in St. Catharines, with many Brockville high school athletes placing in the top 10.